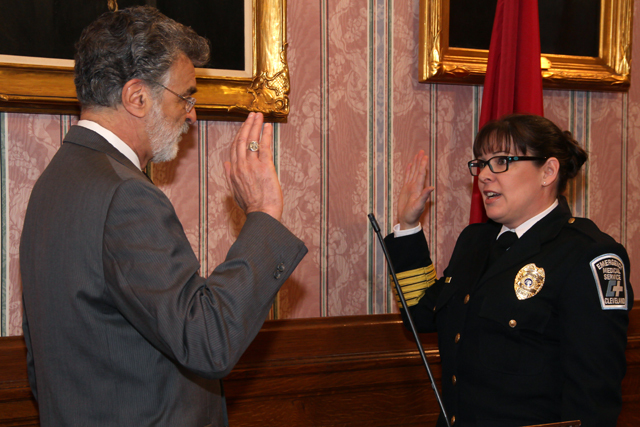 Mayor Frank G. Jackson has administered the Oath of Office to Nicole Carlton, who will serve as the City of Cleveland’s Commissioner of the Division of EMS. Commissioner Carlton has previously served as the Interim Commissioner of EMS, Communications Center Crew Chief, Communications Section Quality Assurance Sergeant, and a Field Operations Captain Deputy Commissioner of Operations. Commissioner Carlton has a number of achievements during her career including implementation of the city’s first public access to defibrillation program, overseeing the installation of Automated External Defibrillators (AED) in city-owned buildings, and creating an agreement with regional hospital systems to eliminate restrictions for ambulance transports. In addition, Commissioner Carlton has improved the Division’s Community Education Program by extensively expanding health screening and other public programs. Commissioner Carlton was appointed to EMS in 1993 as an Emergency Medical Technician and is a resident of Cleveland’s Old Brooklyn neighborhood. She is the Division’s first female Commissioner.